I just got back from my second trip to Austin, Texas this fall. I lived there for a couple of years while going to the University of Texas for library school — or as they call it, “information studies.” What I love about Austin is not just the great weather (I can take the heat!) or the great food (the best breakfast tacos you’ll ever eat). It’s the amazing places book lovers can go to again and again. Let’s go for a little tour! 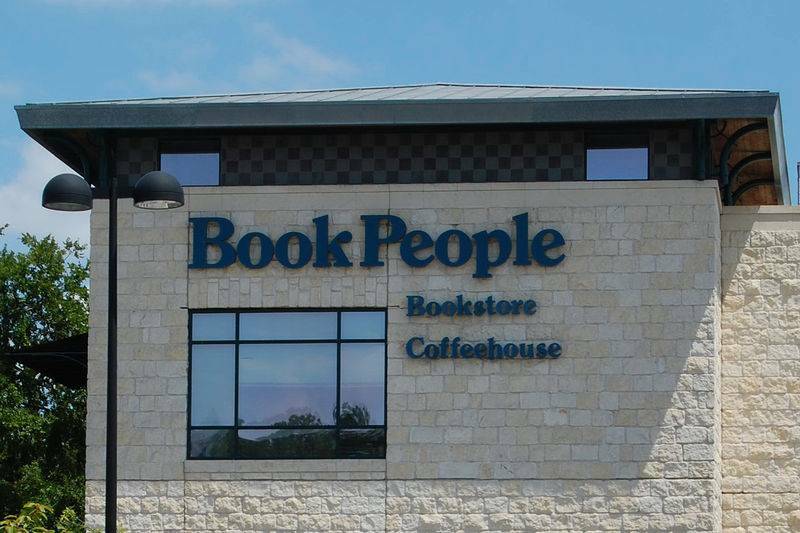 Publishers Weekly called Book People “bookstore of the year” in 2005, and it’s been one of Texas’s leading independent bookstores for decades for good reason. Book People is huge, with so many nooks and crannies to explore. On the ground floor, you’re welcomed in the door by a help desk, with staff who are eager and excited to help if you’re looking for something specific. Behind them is your vast selection of adult fiction, broken out into different genres. You’ll also find your travel books, cook books, and an entire section devoted to all things Texas. Head upstairs and you’ll find another help desk, as well as shelves and shelves worth of more adult non-fiction, including feminist and queer-friendly sections. On the other side of the second floor is one of the largest selections of children’s and YA lit I’ve ever seen in a bookstore. In addition to the books, Book People hosts literary events more nights than they don’t — it was actually at Book People where I got the chance to meet and shake hands with former President Bill Clinton. Book People is wonderful and dangerous, and when you’re in Austin, you’ll no doubt make the stop there more than once. And you’ll walk out with stuffed bags each time. There are tons of other independent and small bookstores scattered throughout Austin, too. If you have a niche reading interest, chances are you’ll have no problem finding a bookstore that you can check out. Books focused on resistance movements, Chicao/a, Latina/o, and Native American studies? Resistencia Books has you covered. Comic fanatic? Then you have no excuse not to check out Austin Books & Comics. Want to see a long-running feminist bookstore? Get yourself on over to BookWoman. How about used and vintage books? South Congress Books has a specialty in photography, art, music, and “quirkiana” titles. Make sure you don’t miss Austin Public Library’s own Recycled Reads. The money raised here by the sale of used books gets returned to the library. But this isn’t your ordinary used bookstore. Since it’s an arm of the library, they offer programming here, as well. They have therapy dog reading time, recycled book crafts, open mic nights, and more. 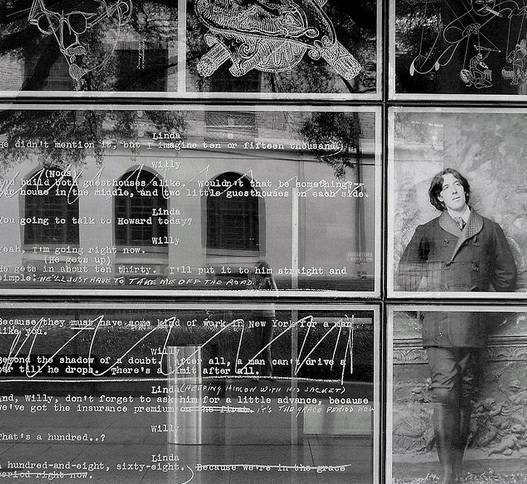 Ransom Center windows, courtesy of Flickr user elmsamy. May I remind you that you’re in Austin, home of the University of Texas, which is home to the world-renowned Harry Ransom Center humanities and literary research center? Located right on the corner of campus, it’s impossible to walk by the building, with literary quotes etched on the windows, without wanting to stop and see what’s inside. When I went to school there, I had access to — and did research on — some of the original editions of classic American literature, and I unearthed a signed Kurt Vonnegut galley while working on a class project. Of course, your average book tourist doesn’t get the chance to do that, but the Ransom Center does house permanent and rotating exhibits that are open to the public. If seeing an original Gutenberg Bible has been on your literary wish list, then you’re in luck. One of the only five complete copies in the US is on permanent exhibit in the lobby. Since you’ll be on campus, why not head uphill to visit a presidential library? The Lyndon Baines Johnson Presidential Library isn’t like your standard library where you can check books out. It’s a research institution that maintains the papers and ephemera of LBJ’s presidential career. Like with the Ransom Center, though, there are exhibits you can check out, including the Presidential limousine. When you’re ready to leave campus, heading south toward downtown will allow you to visit the O. Henry Museum. William Sidney Porter, better known as O. Henry, spent a good chunk of his life in Austin, Texas, and admission to the museum in his honor is free. In addition to being able to check out O. Henry’s life story, the museum hosts reading and writing related events (including an annual pun-off held in May). 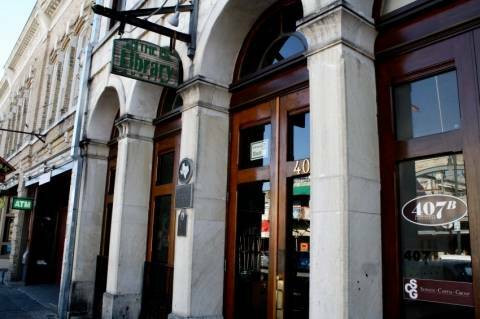 By now you’re likely eager to hit up one of the city’s many libraries. Since the new central library isn’t finished yet (and the current one, while impressive in collection size, isn’t the most visually captivating), I’d recommend checking out the George Washington Carver branch on the east side. This library was the first branch in the city to serve black citizens, and the cultural pride here is evident. The Carver library has an amazing mural painted on the outside wall. Photo courtesy of Flickr user rhaaga. Along your trip, you have a couple of options for indulging your literary side when you find yourself feeling a little thirsty. Bennu Coffee, which from the outside looks like your standard Austin coffee place, is the perfect cafe for the bookishly minded. Their specialty mochas are each named after different literary works. You can order the Don Quixote, a spiced chocolate mocha with whipped cream and a dusting of Mexican spiced powder; The Raven, a dark chocolate mocha with whipped cream and chocolate shavings; or a Great Gatsby, a white and dark chocolate twist of sauces with chocolate shavings, among others. It wouldn’t be a trip to Austin if you didn’t hit up at least one bar on Sixth Street. Lucky for you, you can hit up The Library for your liquor needs. Be warned that it is a college bar, but if you want to sip your whiskey in a place covered in decorative books, then give it a shot. Of course, before you leave town, make sure you stop at Book People again to pick up those few books you forgot, then wander across the street for the best ice cream in the world at Amy’s (I highly recommend the Mexican vanilla while you’re reading that book you just bought). If you plan your tour just right, you might be able to check out the Texas Book Festival, held each fall. And if you love YA lit, you should also check out the annual Austin Teen Book Festival. Both events are free and feature incredible author panels, book talks, and more.